D:Dive Into Mobile conference being held in San Francisco, kick started with a major blow. Google Vice President of Engineering Andy Rubin revealed a prototype for a Motorola Tablet powered by the upcoming version of Android OS, tagged as Honeycomb. Andy Rubin holding the smartly designed tablet grabbed much attention with tech bloggers pushing things to the web. The Motorola tablet features a 3D processor from NVIDIA, delivering graphics in a new way. 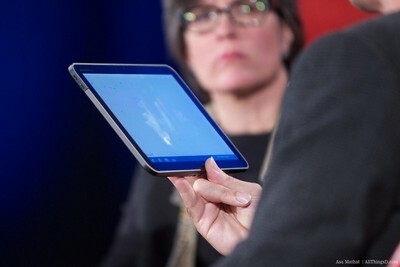 Furthermore, we got to hear that the tablet is buttonless which would clearly act as a challenge for the iPad. It was for long suspected that Google has for long been building a dedicated OS for the tablets and with Rubin showing off the tablet running the new OS, things seem to be confirmed. Honeycomb delivers a new API which allows an application to split its functionality to multiple views. Rubin demonstrated a Gmail app with a two-pane view, quite similar to the Gmail app available on the iPad while the inbox with message would appear in the same pane over the Android phone. The OS is intelligent with Honeycomb having the ability to automatically identify when the Apps are running over a tablet. Android 2.1 OTA Update for Motorola Milestone Owners in Europe?